Our inventory currently contains 1760 matches against your search criteria. White pages, staple detached from bottom staple G $2 Make An Offer! White pages, cover detached from top staple G $2 Make An Offer! VF/NM $69 Make An Offer! Cream/Offwhite pages, front and back cover completely split and reattached with tape CGC 1.5 Fr/G $105,000 Make An Offer! Cream/offwhite pages, small P written on front cover in pencil CGC 7.0 F/VF $4,350 Make An Offer! Offwhite pages, really nice copy CGC 7.5 VF- $3,350 Make An Offer! Offwhite/White pages CGC 7.5 VF- $3,200 Make An Offer! Offwhite/white pages, 154/10 written on front cover in pencil, bit of rust on staple at centerfold VF/VF+ $3,000 Make An Offer! Offwhite/white pages CGC 6.5 F+ $1,250 Make An Offer! Offwhite/white pages, stacking ink transfer top of front cover, VF $1,600 Make An Offer! Offwhite/white pages CGC 8.0 VF $1,400 Make An Offer! Rockford $975 Make An Offer! RESTORED - Slight professional, cover cleaned and reinforced, cream/offwhite pages, small G 12 written on front cover in pen CGC 7.5 VF- $650 Make An Offer! Cream/offwhite pages CGC 6.5 F+ $1,250 Make An Offer! Cream/offwhite pages CGC 6.0 F $3,500 Make An Offer! Offwhite pages CGC 6.5 F+ $650 Make An Offer! Offwhite/white pages F- $650 Make An Offer! Offwhite/white pages, Joker story F $275 Make An Offer! White pages CBCS 7.5 VF- $525 Make An Offer! Coverless, complete, restapled, offwhite pages Pr $20 Make An Offer! Offwhite/white pages VF/VF+ $750 Make An Offer! Offwhite/white pages, small 7-15 written on front cover in grease pencil, deep rich colors VF-/VF $600 Make An Offer! Offwhite pages G- $40 Make An Offer! Offwhite/white pages CGC 6.0 F $5,000 Make An Offer! Pizza Hut Collectors Edition NM $25 Make An Offer! Offwhite/white pages, very nice copy, rich colors VF- $450 Make An Offer! Tape on inside spine, front cover, offwhite pages, complete Fr $25 Make An Offer! Cream/offwhite pages G $40 Make An Offer! Cool cover, cream/offwhite pages CGC 8.0 VF $450 Make An Offer! Cream/offwhite pages, small 5 written on front cover, name written on back cover in pen G- $42 Make An Offer! Missing 2 wraps, cream/offwhite pages Pr $10 Make An Offer! Offwhite pages, cover detached from top staple Fr $20 Make An Offer! Offwhite pages VF $325 Make An Offer! Coverless, complete, offwhite pages, centerfold detached Pr $10 Make An Offer! Tape inside on spine and cover, offwhite pages, complete Fr $15 Make An Offer! Cream/offwhite pages, 3' spine split, tape on inside covers, complete Fr $15 Make An Offer! Coverless, complete, cream/offwhite pages Pr $15 Make An Offer! Offwhite/white pages F/F+ $140 Make An Offer! Offwhite pages Fr/G $20 Make An Offer! Offwhite pages, Joker story VF $210 Make An Offer! Missing 1st wrap, offwhite pages Pr $10 Make An Offer! Offwhite/white pages VG+ $110 Make An Offer! Offwhite/white pages, original owner collection, 4 inch tear along spine from another convention mauling. G $185 Make An Offer! Cream/Offwhite pages F- $100 Make An Offer! Offwhite pages G- $30 Make An Offer! Offwhite pages G $30 Make An Offer! Offwhite pages, centerfold detached from top staple G $18 Make An Offer! Offwhite pages VF $250 Make An Offer! white pages G $16 Make An Offer! Offwhite pages G $15 Make An Offer! Offwhite pages, centerfold detached from top staple G $15 Make An Offer! Offwhite pages, tape on inside cover, 3' bottom spine split G $12 Make An Offer! Offwhite pages G+ $20 Make An Offer! Offwhite pages, OCT 22 1963 stamped on front cover G- $12 Make An Offer! Offwhite pages, tiny tiny 12 written in DC logo in pen VF/NM $300 Make An Offer! Offwhite pages, cover detached from bottom staple VG $25 Make An Offer! Offwhite/white pages F/F+ $55 Make An Offer! Offwhite pages, centerfold detached from bottom staple VF $110 Make An Offer! Diamond Run $160 Make An Offer! Offwhite pages VG+ $36 Make An Offer! VG $18 Make An Offer! Original owner collection, offwhite pages, cf detached at bottom staple VF $65 Make An Offer! Offwhite pages F- $30 Make An Offer! White pages, nice book CGC 9.0 VF/NM $210 Make An Offer! White pages VF/NM $165 Make An Offer! Offwhite/white pages VF/NM $230 Make An Offer! Original owner collection, offwhite pages, top staple lightly rusted VF- $55 Make An Offer! Cream/offwhite pages F+ $38 Make An Offer! Offwhite/white pages CGC 9.0 VF/NM $4,500 Make An Offer! White pages, if you want a 8.5 that looks like a 9.4 CGC 8.5 VF+ $4,000 Make An Offer! Offwhite pages F/VF $60 Make An Offer! White pages F/VF $55 Make An Offer! Cream/Offwhite pages, light subscription crease F $28 Make An Offer! Offwhite pages F+ $40 Make An Offer! Diamond Run $125 Make An Offer! Offwhite pages F- $28 Make An Offer! Offwhite/white pages,B.66 and Jim written on front cover in pen G $10 Make An Offer! White pages VF/NM $175 Make An Offer! Offwhite pages VF $62 Make An Offer! OffWhite pages, tiny 9-6 written on front cover VG $18 Make An Offer! cream/off white pages, 67/76/9 written on cover in pen G $10 Make An Offer! Tear BC F $95 Make An Offer! Cream/offwhite pages PGX 9.2 NM- $350 Make An Offer! Offwhite pages F- $18 Make An Offer! Offwhite/White pages, OCT. 17 1968 stamped on back cover VF/NM $115 Make An Offer! White pages, MAY 4 recd stamped on front cover NM $275 Make An Offer! Offwhite pages VF/VF+ $70 Make An Offer! Cream/Offwhite pages, tiny bit of foxing on back cover VF+ $55 Make An Offer! Signature Series with White Pages CGC 9.6 NM+ $5,995 Make An Offer! Cream/Offwhite pages VF/NM $110 Make An Offer! 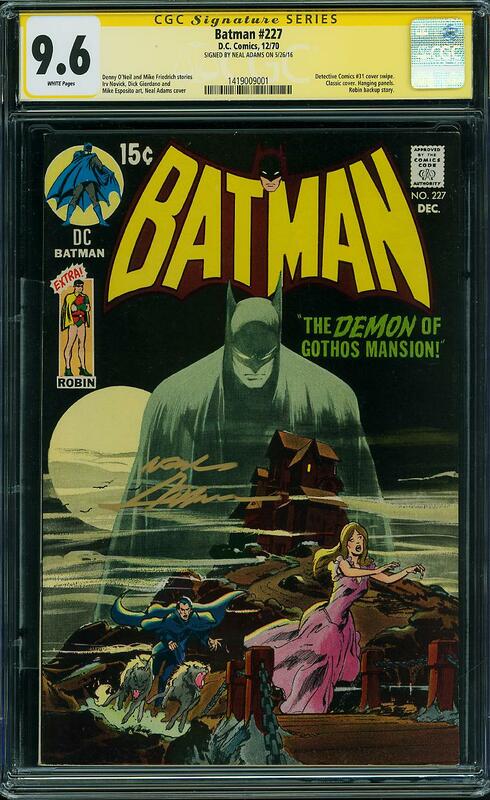 Qualified because Neal signature was not witnessed, White pages CGC 9.4 NM $425 Make An Offer! Offwhite pages, '30' written on cover in pen G/VG $20 Make An Offer! Offwhite pages NM-/NM $140 Make An Offer! Offwhite/White pages CGC 9.2 NM- $140 Make An Offer! Offwhite pages CBCS 9.0 VF/NM $225 Make An Offer! Offwhite/white pages G $10 Make An Offer! Offwhite pages CGC 9.0 VF/NM $285 Make An Offer! Cream/Offwhite pages VF+ $125 Make An Offer! Offwhite pages VF/VF+ $25 Make An Offer! Offwhite pages NM-/NM $110 Make An Offer! White pages VF $36 Make An Offer! Offwhite pages, cover detached from top staple F $12 Make An Offer! Offwhite pages, MAR 13 stamped on front cover VG $10 Make An Offer! Offwhite pages VG- $8 Make An Offer! Pacific Coast $450 Make An Offer! White pages VF- $38 Make An Offer! Offwhite pages CGC 8.0 VF $65 Make An Offer! White pages NM- $140 Make An Offer! Offwhite/white pages CGC 9.4 NM $260 Make An Offer! White cover, white pages NM- $125 Make An Offer! White pages CGC 8.5 VF+ $75 Make An Offer! Offwhite pages, MAY 12 B stamped on back cover VF/VF+ $13 Make An Offer! Cream/Offwhite pages, DEC 12 B stamped on back cover VF- $8 Make An Offer! Offwhite pages, AUG 13 B stamped on back cover VF+ $12 Make An Offer! White pages NM/NM+ $55 Make An Offer! Cream/Offwhite pages VF+ $12 Make An Offer! Cream/Offwhite pages VF $10 Make An Offer! Front cover torn off, offwhite pages Pr $1 Make An Offer! Offwhite/white pages F/F+ $10 Make An Offer! offwhite/white pages NM-/NM $35 Make An Offer! White pages NM- $32 Make An Offer! Offwhite/white pages F-/F $6 Make An Offer! Offwhite pages NM $40 Make An Offer! White pages, tiny tear top back cover VF+ $20 Make An Offer! Offwhite/white pages, small JIC written on top of back cover VF/NM $18 Make An Offer! Cream/offwhite pages CGC 8.5 VF+ $25 Make An Offer! Offwhite/white pages, Whitman Variant VF- $20 Make An Offer! Original owner collection, offwhite pages VF- $7 Make An Offer! Offwhite/white pages NM+ $35 Make An Offer! Offwhite/White pages CGC 9.2 NM- $35 Make An Offer! White pages CBCS 9.8 NM/M $45 Make An Offer! White pages NM+ $24 Make An Offer! Offwhite/white pages, not a tear in top of front cover NM $25 Make An Offer! White pages NM $22 Make An Offer! White pages CBCS 9.6 NM+ $75 Make An Offer! White pages CGC 9.0 VF/NM $160 Make An Offer! White pages CGC 9.6 NM+ $45 Make An Offer! cool villan cover, white pages NM $10 Make An Offer! White pages VF- $14 Make An Offer! White pages NM+ $45 Make An Offer! White pages CGC 9.2 NM- $30 Make An Offer! White pages CGC 9.6 NM+ $55 Make An Offer! Offwhite/white pages CGC 9.4 NM $35 Make An Offer! White pages CGC 9.4 NM $45 Make An Offer! White pages, New Origin Jason Todd (Robin) NM+ $50 Make An Offer! Offwhite pages, sweet copy NM $8 Make An Offer! Offwhite/white pages NM/NM+ $32 Make An Offer! Offwhite/white pages NM- $3 Make An Offer! Offwhite/white pages VF $12 Make An Offer! white pages F $5 Make An Offer! White pages CGC 9.4 NM $20 Make An Offer! Offwhite/white pages NM-/NM $3 Make An Offer! White pages, Great Joker cover NM+ $12 Make An Offer! White pages, cool joker cover VF/NM $3 Make An Offer! White pages F/VF $4 Make An Offer! Offwhite/White pages F $2 Make An Offer! White pages NM+ $9 Make An Offer! White pages, Die cut cover NM+ $10 Make An Offer! White pages, collector edition VF $5 Make An Offer! White pages F $1 Make An Offer! White pagers NM $4 Make An Offer! White pages, regular cover NM $4 Make An Offer! White pagers NM+ $9 Make An Offer! White pages, glow in the dark cover NM+ $8 Make An Offer! White pagers NM+ $5 Make An Offer! White pages, special fold out cover NM+ $10 Make An Offer! White pages, collectors edition with chase cards NM+ $10 Make An Offer! White pagers VF+ $3 Make An Offer! White pages PGX 9.8 NM/M $200 Make An Offer! White pages, Joker and Harley Quinn story NM+ $65 Make An Offer! White pages CGC 9.4 NM $60 Make An Offer! White pagers VF- $6 Make An Offer! White pagers, NY post exclusive F $3 Make An Offer! White pages VF/NM $7 Make An Offer! White pages, Variant cover CGC 9.8 NM/M $95 Make An Offer! White pages, Villain variant cover CGC 9.6 NM+ $65 Make An Offer! White pages, Hero cover variant NM+ $25 Make An Offer! Newstand cover, white pages NM+ $10 Make An Offer! White pages, 2nd printing Riddler Chess cover NM+ $10 Make An Offer! White pages, Riddler variant cover NM+ $10 Make An Offer! Tri fold Villain cover, White pages NM $8 Make An Offer! White pages PGX 9.6 NM+ $110 Make An Offer! White pages, 2nd print NM+ $6 Make An Offer! White pages PGX 9.8 NM/M $135 Make An Offer! White pages NM+ $85 Make An Offer! SIGNATURE SERIES, signed by Alex Ross, White pages CGC 9.8 NM/M $125 Make An Offer! White pages, 2nd print CGC 9.8 NM/M $65 Make An Offer! White pages, Jim Lee Variant cover NM+ $25 Make An Offer! White pages, variant cover NM $18 Make An Offer! White pages, variant cover NM+ $25 Make An Offer! White pages, variant cover VF/NM $15 Make An Offer! White pages, variant cover NM $20 Make An Offer! White pages, Variant cover CGC 9.8 NM/M $50 Make An Offer! SIGNATURE SERIES - Signed by Greg Capullo, NY Comic con edition, White pages CGC 9.8 NM/M $80 Make An Offer! White pages PGX 9.8 NM/M $65 Make An Offer! White pages CGC 9.8 NM/M $120 Make An Offer! White pages CBCS 9.8 NM/M $65 Make An Offer! White pages CBCS 9.8 NM/M $110 Make An Offer! White pages CGC 9.4 NM $800 Make An Offer! White pages CBCS 9.8 NM/M $100 Make An Offer! White pages NM/NM+ $85 Make An Offer! White pages NM+ $250 Make An Offer! White pages CGC 9.6 NM+ $90 Make An Offer! Offwhite pages CGC 7.0 F/VF $300 Make An Offer! Offwhite pages, rich colors, original owner collection VG/F $150 Make An Offer! Cream/offwhite pages, JUL 29 PM stamped on front cover VG+ $130 Make An Offer! Offwhite pages, C6/28 written on front cover, 1 inch top spine split VG $110 Make An Offer! 6' spine split, small 27 written on front cover, offwhite pages Fr/G $25 Make An Offer! White pages VG+ $60 Make An Offer! Coverless, complete, cream/offwhite pages Pr $10 Make An Offer! White pages, CC/20 written on front cover F $75 Make An Offer! Offwhite pages, small 6/14 written on front cover in pencil VG $56 Make An Offer! White pages, C11/11 written on front cover F+ $45 Make An Offer! Offwhite pages F- $40 Make An Offer! Offwhite pages, tiny 11 5 written on front cover in pen F+ $65 Make An Offer! Original owner collection, cream/offwhite pages G+ $20 Make An Offer! Offwhite pages G $14 Make An Offer! Offwhite pages, rich colors F $35 Make An Offer! Original owner collection, cream/offwhite pages VG+ $30 Make An Offer! White pages VF+ $125 Make An Offer! Original owner collection, offwhite pages F- $35 Make An Offer! White pages, Return of the Joker, Harley Quinn NM+ $45 Make An Offer! Offwhite/White pages, tiny 3/30 written on front cover in pen NM- $145 Make An Offer! White pages VF+ $26 Make An Offer! Offwhite/White pages NM-/NM $55 Make An Offer! White pages, wrap around cover NM- $48 Make An Offer! White pages CBCS 9.6 NM+ $65 Make An Offer! White pages NM/M $9 Make An Offer! White pages, really nice 9.6, shot at 9.8 NM+ $175 Make An Offer! White pages, sweet copy NM+ $150 Make An Offer! White pages, 6th printing CGC 9.4 NM $50 Make An Offer! White pages CGC 9.6 NM+ $300 Make An Offer! White pages F/VF $2 Make An Offer! White pages NM/M $15 Make An Offer! White pagers NM $6 Make An Offer! White pages, cool cover VF $6 Make An Offer! NM+ $10 Make An Offer! White pages NM/M $25 Make An Offer! White pages CGC 9.8 NM/M $350 Make An Offer! White pages CGC 9.4 NM $110 Make An Offer! White pages, signed by Chuck Dixon and Graham Nolan NM/NM+ $125 Make An Offer! Offwhite/white pages F/VF $250 Make An Offer! Cream/offwhite pages, small 71 written on front cover in pencil F $90 Make An Offer! Offwhite pages, P10/30 written on front cover in pen, original owner collection VG $45 Make An Offer! Offwhite pages VG- $50 Make An Offer! Offwhite pages F $100 Make An Offer! Cream/offwhite pages, chip off back cover, lou written on back cover, rich colors front cover VG+ $60 Make An Offer! Offwhite pages, P10/30 written on front cover in pen VG+ $16 Make An Offer! VF $12 Make An Offer! Offwhite pages, water stain back cover VG $6 Make An Offer! Offwhite pages, piece out on top of staple VG+ $7 Make An Offer! Offwhite pages F+ $100 Make An Offer! Offwhite pages, ROSE stamped on back cover, cover detached VG $15 Make An Offer! F/VF $20 Make An Offer! VF $17 Make An Offer! VF/NM $38 Make An Offer! Deep rich inks/colors, offwhite pages VF/NM $14 Make An Offer! Cream pages VF $9 Make An Offer! Offwhite pages, nice copy NM- $10 Make An Offer! Offwhite pages, very light subscription crease VG/F $3 Make An Offer! Deep and glossy inks, offwhite pages VF/NM $6 Make An Offer! VF $60 Make An Offer! VF $36 Make An Offer! Cream/offwhite pages, 4/25 written on front cover in pencil F- $16 Make An Offer! Offwhite pages, 35 written on top of back cover in pencil VG+ $12 Make An Offer! Offwhite pages VG- $9 Make An Offer! Sweet copy, offwhite/white pages NM- $25 Make An Offer! Offwhite pages, chip off spine VG $75 Make An Offer! Beautiful copy, offwhite/white pages CGC 9.4 NM $475 Make An Offer! VF $75 Make An Offer! VG+ $20 Make An Offer! VF+ $50 Make An Offer! Cream/offwhite pages CGC 8.0 VF $40 Make An Offer! White pages VF $32 Make An Offer! Cream/offwhite pages CGC 7.5 VF- $40 Make An Offer! White pages F+ $18 Make An Offer! Offwhite pages, heavy water staining, bottom staple rusted G $7 Make An Offer! Offwhite pages, heavy water staining, rusted staples G $7 Make An Offer! Offwhite pages, water staining, rusted staples G $7 Make An Offer! Offwhite pages, water staining, rusted staples G $6 Make An Offer! Offwhite pages, Bruce Smith written on top of splash page in pen, water staining, rusted staples G $6 Make An Offer! Offwhite pages, water staining, rust on staples G $6 Make An Offer! Offwhite pages, small H written on front cover, foxing on front/back cover VG+ $210 Make An Offer! Offwhite pages, 11 7 written in top left corner in grease pencil, Eddie's book store stamped on front cover F $145 Make An Offer! G+ $40 Make An Offer! Offwhite/white pages F $200 Make An Offer! Offwhite pages, P12-8 written on front cover VG $16 Make An Offer! Offwhite pages, tiny water spot on top of book VF $16 Make An Offer! Offwhite/white pages VF/VF+ $24 Make An Offer! Offwhite/White pages, light foxing front cover F $6 Make An Offer! Offwhite pages VF/NM $13 Make An Offer! Offwhite pages F/VF $8 Make An Offer! Unlikely Heroes, Neal Adams art, Original owner collection, offwhite pages VF $9 Make An Offer! Original owner collection, white pages NM- $9 Make An Offer! Offwhite pages NM $18 Make An Offer! Original owner collection, white pages VF/NM $10 Make An Offer! Original owner collection, white pages VF $5 Make An Offer! offwhite pages VF+ $325 Make An Offer! Cream/offwhite pages G $1 Make An Offer! White pagees CGC 9.6 NM+ $50 Make An Offer! White pages, small price sticker on inside back cover F $6 Make An Offer! Offwhite pages, Simon & Kirby, lower right corner chipped off VF $325 Make An Offer! F $29 Make An Offer! Deep rich colors, cream/offwhite pages VF- $50 Make An Offer!